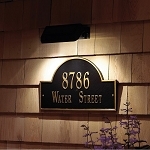 This established date plaque is made of slate, a highly durable natural product that has been newly quarried in the U.S.A. 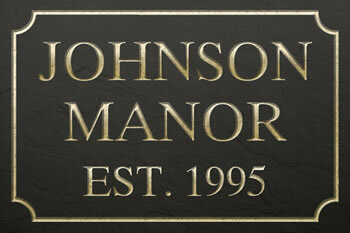 The plaque is finished with weather-resistant enamels and will retain its beauty for years to come. The text and trim are carved into the hand-cut slate, painted, and then sealed for further protection. The trim matches the text color. Made in USA. I was very satisfied with your product. It was exactly how i hoped it would be. It will decorate the porch of our mountain cabin for years to come. Thank you.